A visually-unique electro suitable for collectors and acoustic enthusiasts alike. Some minor quality control lapses. A unique looking signature acoustic for under £500. You might think the shape resembles what a regular 000 would look like in a funhouse mirror. The Armstrong involvement is indicated by several subtle nods on the guitar. The Fishman Presys Blend preamp handles the plugged-in sounds. Gordon Giltrap is one of the most respected acoustic guitarist these shores have ever produced. A true pioneer of his art, Giltrap has released a staggering 30 albums over four decades. His unadulterated love for what he describes as "the hollow magic box" has resulted in Giltrap amassing an enviable collection of guitars. About 10 years ago, Giltrap purchased a Rob Armstrong guitar built in 1980. This evergreen instrument continues to be at the forefront of Gordon's recordings and concerts alike. It's this prized guitar that serves as the template for this new Vintage signature model. The VE2000GG is a curious looking guitar. Fans and followers of Giltrap will be familiar with its unusual shape, but first time viewers are struck by the sweeping lines and ultra-tight waist. In fact, you might well think this is how a regular 000 would look in a funhouse mirror. In essence, the VE2000GG falls somewhere between a Grand Auditorium and an 000; the upper bout more 000, the lower bout more Grand Auditorium. This morphing of two established guitar models produces a comparatively uncommon scale length of 642mm/25.27-inch, which splits the difference between the more common scale lengths of 633mm/24.9-inch and 645mm/25.4-inch. The VE2000GG's waist is very slender, measuring just 206mm - a full 31mm narrower than a Martin OM28. If the guitar lacks capacity in the upper bout, it makes up for it in the lower bout, which measures a full 405mm at its widest, pushing it closer to jumbo territory. These pear-shaped dimensions actually make for a very comfortable guitar. Whether played with a raised left foot (as Giltrap does) or in the more common seated with raised right leg position, the VE2000GG feels well balanced, secure and non-taxing. In keeping with Giltrap's 'original' Armstrong, fabulous pieces of solid North American red cedar, with tight, ruler-straight grain, have been used for the book-matched soundboard. A bright, honey-hued selection of mahogany makes the back, sides and five-piece 'C' profile stacked-heel neck. Contrasting binding and coach-lining to both the back and front accentuates the VE2000GG's curves. We particularly like the detailed parquetry featured on the guitar's back, which serves to join the two pieces of laminate mahogany. This same parquetry runs along the base to where the strap button/jack input is located. The VE2000GG is simply yet effectively appointed: a simple rosette, abalone-inlaid fretboard markers and an elegant 12th fret 'wings' inlaid motif is also abalone. Giltrap's Armstrong has two pickguards. Our review model isn't fitted with any, although future models will ship with an unfitted, standard tortoiseshell pickguard, so you have the option to fit it post-purchase. The tapered headstock is Armstrong's signature shape and it incorporates a truss rod cover that features the Armstrong 'A' logo. In our view, having lines as dramatic as these removes the need for more embellishment and JHS (the UK company behind the Vintage brand), along with input from Giltrap and Armstrong, have done an excellent job in presenting a stylish, eye-catching and yet tasteful guitar. Overall build quality is generally very good, although inspection of the guitar's sound chamber reveals some evidence of lapses in quality control. Excess smudges of glue can be seen beneath the inner kerfed lining where it fails to sit snug against the guitar's back, as well as blobs of more glue to the guitar's inner sides. Also, the lining has been cut roughly, leaving behind small splinters of wood, which creates an untidy appearance. In truth, none of these issues are likely to impact on tone, but they contrast with the guitar's exterior and satin finish, which is as clean as a whistle. That said, it's good to see that the electrics cabling has all been looped and neatly clipped to reduce any unwanted rattle. The onboard electronics are by Fishman, of which Giltrap is a long-time user. His Armstrong is fitted with a Rare Earth retro-fit soundhole pickup and our review model features a Sonicore undersaddle pickup and the Presys (formerly known as Aero) Blend preamp, which features a built-in microphone with mic blend control, notch (anti-feedback) control, phase control button, low battery indicator, three-band EQ and volume control, as well as a built-in tuner. The unit itself pivots ingeniously providing access to the nine-volt battery - although according to Fishman, you'll only need such access every 88 hours. It's all very tidy, clear and easy to use. 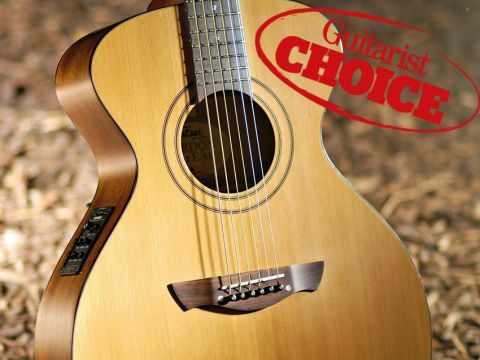 Despite its large lower bout, the VE2000GG is a lightweight guitar and as such it performs with great responsiveness. Dynamics and tonal nuances are easily coaxed out of this guitar and it's quick to respond to all manner of playing styles and techniques. The guitar's timbre has a plump, rich bass, which underpins a surprisingly bright and powerful midrange. It's not a loud guitar, particularly when compared to similar priced folk and OM shaped competitors, but what it lacks volume it makes up for in character. Rob Armstrong's unique body design creates a warm, sweet tone which bridges the gap between the rich, fullness and clout of a larger bodied guitar with the bright, sweet, clarity of a smaller body. Plugged in, the VE2000GG morphs into a different beast altogether. In place of sweetness we found rasp and punch in abundance. In fact, it took a little time to pull the tone back from sounding brash and brittle. However, with a boost to the bass and rolling off the mids along with cutting the mic, we found a likeable and well balanced tone suitable for fingerstyle and Giltrap-like triplet-filled, chord work. If you're test-driving this model, we'd suggest allowing plenty of time familiarising yourself with the intricacies of the preamp, as first impressions don't necessarily give a true reflection of its actual capabilities. It's not often that consumers are given the opportunity to add a genuine 'clone' to their collection. The VE2000GG is as close as most of us are going to get to a top pro's actual guitar and JHS, Armstrong and Giltrap should be commended for making this happen. Yes, there might be some quality control issues with the first production models and, yes, the plugged in Fishman setup takes some getting used to, but once past these issues we're left with a visually unique, tonally balanced and capable little cracker complete with a specially built Kinsman hard shell case - all for less than £500! Now that's a real recession-busting price.